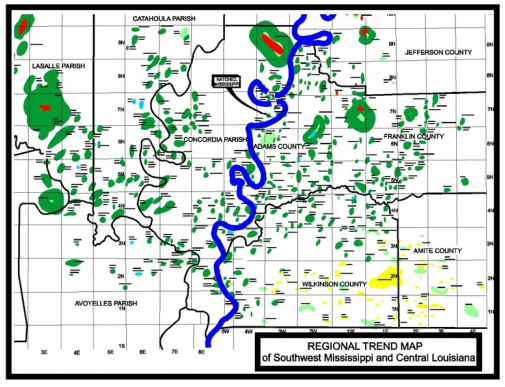 Currently generating shallow oil prospects in the Louisiana portion of the Central Louisiana/Southwest Mississippi Wilcox Oil Trend for sale to companies looking to develop a portfolio of prospects in this established and financially lucrative oil play. This mature exploration area consists of numerous oil producing sands, often with several productive sands “stacked” in one location, that have produced millions of barrels of high quality Louisiana sweet crude. The oil industry continues to extensively explore this area because many opportunities remain to locate and produce large quantities of oil at relatively low costs. Wells drilled in the Central Louisiana/Southwest Mississippi Wilcox Oil Trend are shallow in depth, vertically drilled and conventionally completed. Productive wells are long lived with low decline rates after the initial flush oil is produced and relatively steady production is established. Wells are inexpensive to drill and typically have low operating and on-going maintenance costs.